Taking Care of Pet Rabbits. How to ensure healthy physical surroundings for your pet rabbit, including keep your pet bunny rabbit safe from predators and other dangers. You’ve prepared a cage for your pet rabbit. You know just how much room you’ll allow the bunny to roam in your house. Or, your pet rabbit has a hutch outside and a rabbit run for roaming and nibbling. Let’s examine the bigger picture, the environment as a whole, so you can ensure your rabbit stays safe and healthy. If you came to this page looking for guidance on feeding or other factors of pet rabbit care, please visit our Pet Rabbits page, where you will find links to all the info you need. Rabbits do COLD much better than HOT. Indoors: keep its main living space (cage) far away from fire places and heating vents. Indoor temperatures of up to 72 degrees are very comfortable for your rabbit. Outdoors: Keep your rabbits dry; watch the weather reports and thermometer for your area. Summer is much more concerning than usual winter temperatures, even temps below zero. Temps up to 85F are fine. From 86 - 91 is the red zone, unless your rabbit was bred for being acclimated to heat. Over 92F, and you risk the death of your pet. See Cooling Rabbits for ways to keep your pet rabbits cool in summer. DRAFTS stress a rabbit considerably. The stress can drain the immune system to the point of illness. Indoors: Tuck cages into corners and cover the tops, if possible. Or, give your pet rabbit a cardboard box to take shelter in. Outdoors is where you’re more likely to encounter draftiness. Enclosed wooden hutches solve the problem of drafts, but have ventilation problems. For all-wire cages, protect the rabbit’s cage or hutch in the direction of the prevailing winds. Drafts are also reduced by putting cages in a barn or under a canopy. The biggest concern is the build up of ammonia in the air from the rabbit’s urine. Poor ventilation and infrequent cleaning is a sure-fire guarantee for respiratory problems, including snuffles (pasteurella multocida). Indoors: Don’t use plastic cages; always get cages with wire sides. Empty the dropping pan or litter box at least once a week, and use wood-based rabbit litter and beddings. 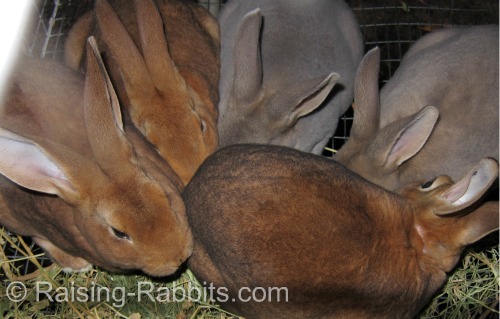 See Rabbit Bedding for recommendations. Outdoors: If your rabbit is housed in an enclosed wooden hutch, his space will need close monitoring for odors, cleanliness and temperature. If you can smell the ammonia, so can the rabbit, which lives in its hutch most of every day. A wire floor definitely helps, but if yours has a solid floor, the straw and droppings need frequent removal and cleaning. They can go into the vegetable garden as mulch and soil enrichment. Loud noises and frenetic activity also stress rabbits, especially house rabbits, if they cannot run and hide. Rabbits have been known to die of fright. Indoors: Place your bunny's cage out of the way of the main living areas. If your rabbits also have the run of the house (or a part of the home), you can set up a second retreat to which the rabbit can run and hide (or it may select its own retreat). Outdoors: The outdoors are full of noises and activities, to which your bunnies will become accustomed. Don't forget you're always taking care of pet rabbits - when you mow, start at the other end of the yard. Keep your pet rabbits in mind and minimize the sudden, unusual and startling noises and activities. Flies can become a pesky annoyance both to people and to rabbits, as well as a vector for some diseases. Inside: Frequent emptying of your rabbit’s manure will keep odors and flies at bay. Outside: Natural healthy ways to reduce or eliminate flies include Fly Predators. There is no down side that we can see to the tiny insects that prey on fly cocoons but never bother people. If you live in the country, or within the limits of various cities throughout the USA, you can also keep chickens and/or ducks, which are omnivores and will gladly snap the flies right out of the air for you - AND eat any maggots they find in the droppings under your rabbit hutches. A sturdy cage - our all-wire cage plans with PVC frames are just about as sturdy and predator-safe as one can get. 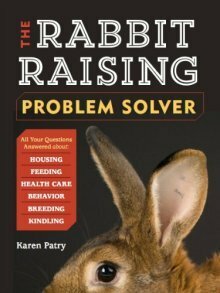 Our e-book, Pet Rabbit Living Spaces, offers a variety of predator-safe housing plans and variations on those plans. Your other pets, your carnivore dogs and cats, may be alarming to your rabbits, at least at first. Are you sure they don’t harbor malevolent intent against your pet rabbits? Shop at Amazon.com for cages, hutches, rabbit supplies, as well as books and information about how to safely introduce your rabbits to your other pets. with gentle hands and voice.